Government: King Amaeolus Tier’rae Dayemeral is the undisputed ruler of the city and Quon. He is advised by the Duchal Embassy serving as a sort of congress. Defenses: The Crescent make up Shalan’ir and Quon’s military might. Shalan’ir also has an elite guard known as The Templars who take their orders directly from the king. Beneath the gargantuan tree canopy overlooking Lake Vanalas lies Shalan’ir, the capitol of Quon. 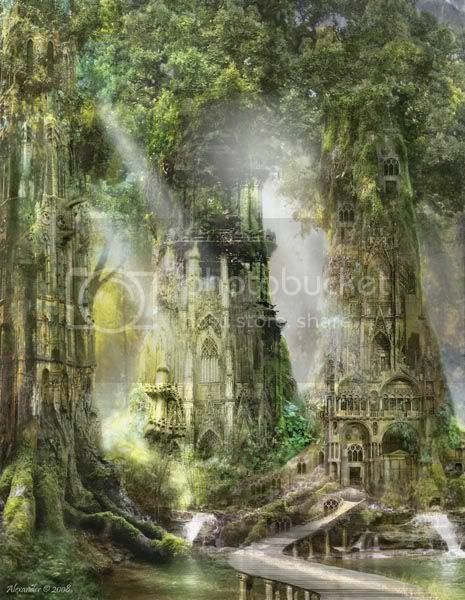 Home of the Eladrin and Elven population in Quon, this city lies nestled within a circle of twelve ancient fey spires; the mighiest of which directly on the bank of Lake Vanalas, serving as the king’s throneroom where all governmental duties are carried out. Shalan’ir is considered a worldfall, residing chiefly in the Mortal World, then for 5 hours each night, entering the Feywild. Shalan’ir is famous most notably for The Quon Academy of Arcane Arts.